Our two previous Software Assurance bulletins have been focused on specific areas of development and so this bulletin covers an extensive list of general enhancements that have been developed in readiness for axis diplomat 2016 but which are being made available now to Software Assurance customers running axis diplomat 2014. We expect to release a further Software Assurance Bulletin early in the New Year, focusing on developments to the Purchase Ledger and Purchase Order Processing. If you do not currently have Software Assurance and would like to discuss adding it to your support contract, please speak to your Account Manager or complete a Software Assurance Enquiry Form. Any of the enquiry or maintenance functions associated with the items above now feature an additional button in the lower right corner labelled "Send Shortcut". Clicking this button will create an empty email message with an .axs file attached. When the recipient of that email opens that attached file, it launches an axis diplomat enquiry for that item. Note that the attachment is a link to the item; it does not in itself contain information about the item so the recipient must be a user of your axis diplomat system. They must also have the appropriate permissions to view that item. Sales Business Intelligence now shows two separate Order Source tabs - the original one ("Order Sources") shows the transactions grouped by the Order Source codes associated with the actual sales transactions whilst the new one ("Customer Order Sources") shows the same transactions but grouped according to the default Order Source codes on each Customer Account. A number of different supervisor functions, each designed to perform specific updates to ranges of customer accounts, have been replaced with a single new Customer Record Block Amendment function. This new function is easier to use and allows a range of amendments to be made at once. The scrolling data list of search results when adding an item to a Sales Order (such as Stock Reference Search or Keyword Search) has been extended to include additional columns for the retail price, trade price, sales group code and sales group description. Not only does this allow you to sort the results (to make finding the right item even easier) but also allows you to see, at a glance, the buying price for the customer and how it compares to the standard Retail and Trade prices. Searching without entering any particular search term will list all items on the stock ledger so this is a quick and easy way of producing a full pricelist for a specific customer on an ad hoc basis; in conjunction with the export to Excel capability common to all scrolling data lists, this is a simple way to produce a pricing spreadsheet to send to a customer. You could even reduce the columns shown to just the information required and save that as a View Profile to minimise the amount of work in Excel prior to sending to the customer. This development enhances the ability to analyse the successful conversion of quotations. It changes the behaviour of "Convert Quote to Order" so that, instead of the quote being changed into a Sales Order, the quotation is automatically closed and a new sales order created with the same document reference. This ensures that there is a always a quotation to compare with, regardless of whether the original quotation was copied to a sales order or converted into a sales order. A more complete description of the facility is available within the axis diplomat Documentation Database at https://www.axisfirst.co.uk/documentation/Quotation-Reporting/articles/11161 (login required). The function has also been made significantly faster for larger systems by leveraging the power of your SQL Server. The function Amend GOA Booking now allows you to change any additional description text within the booking. The optional function Import Cash Receipts (part of the Sales Transaction Import Functions module) has been extended to allow customer accounts to be specified in the import file by Short Name rather than Account Number. This report, that lists all of the customer notes on selected accounts, has been extended to allow selection by Account Type - Open, Closed and/or Prospect. When part-shipping sales orders, valid discrepancies can occur between the sum of the individual invoices and the original expected order total - due to either VAT rounding or discount rounding. When invoicing to credit account customers, this does not cause an issue but when dealing with cash with order customers (typically those paying by credit card) it is possible that the sum of the invoices may exceed the original payment taken (typically by a penny or two) which could prevent the final invoice being released as there are insufficient funds available. A new Sales Order Processing parameter has been introduced ("Maximum under payment") which allows you to specify a value (for example £0.05) to still allow these final deliveries and invoices to be processed. When viewing a list of images attached to a Stock item (or an eBusiness Group for users with axis vMerchant websites), additional options are now available when right-clicking on an image in the list. Options are now available to allow you to Open, Open With, Edit and Save As. These options are ideal if you are using your axis diplomat system as the master repository for your product images and users need to be able to access copies of the images (to send to a publisher or designer, for example). For customers using the Warehousing Module, the Picked quantity is now shown within Stock Enquiry, alongside other stock quantities (such as Stock on Hand and Allocated). The information broken down by Location is also shown on the Location Details tab. 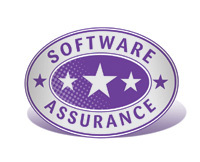 If you do not currently have Software Assurance and would like to discuss it further, please speak to your Account Manager or complete a Software Assurance Enquiry Form.